The book gets its name from the monastery of Kells, County Meath, Ireland. The book is believed to have been brought to Kells following a Viking raid on the monastery on the island of Iona, Scotland, in 806. The Book of Kells, was written more than 1,200 years ago by monks in medieval Ireland. It is one of the most famous and valuable illuminated manuscripts to have survived to modern times. The Book of Kells is one of many Gospel manuscripts written from the late sixth century to the early ninth century in the monasteries in Scotland, northern England, and Ireland. The Book of Kells was produced late in this period, perhaps around the beginning of the ninth century, and represents the high point in writing these artistic manuscripts. 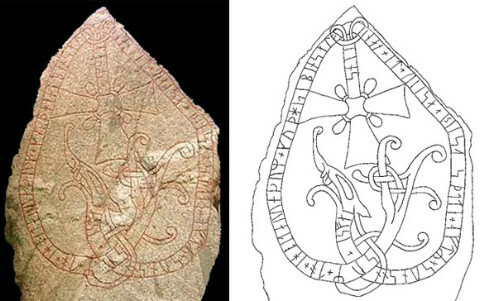 is a distinct Viking influence on their art. based on the exceptional quality of the images found in the Book of Kells. 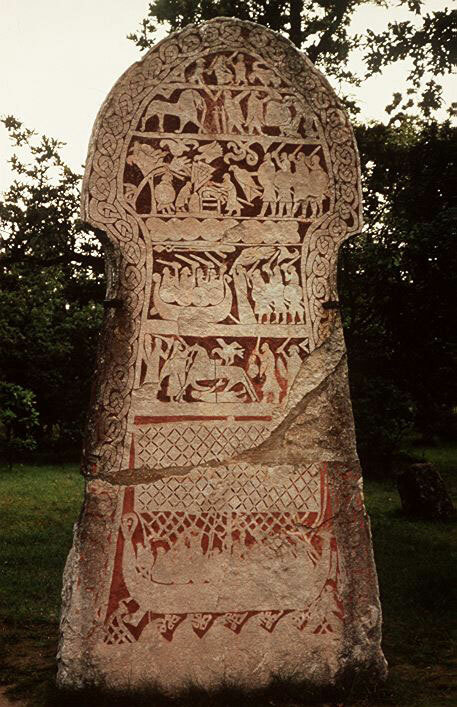 The interlacing patterns intertwined with fantastic creatures were adopted from Viking art and became Irish and Anglo-saxon motifs. 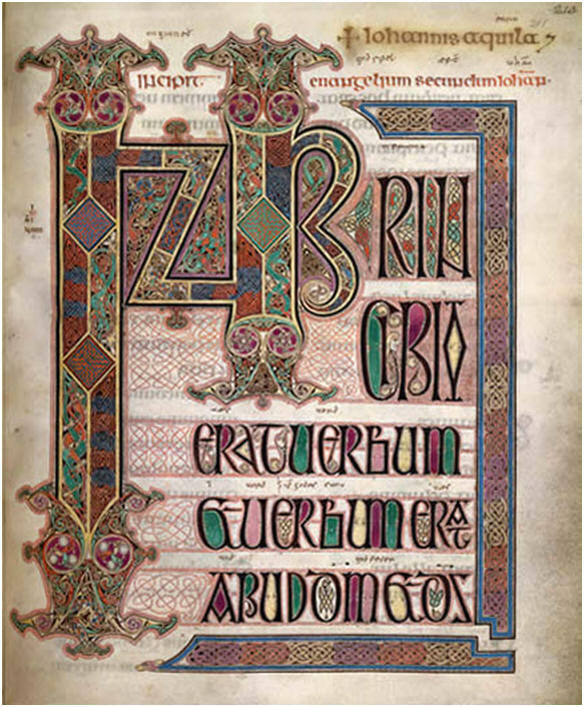 The Lindisfarne Gospels are now part of the collection of the British Library, London. 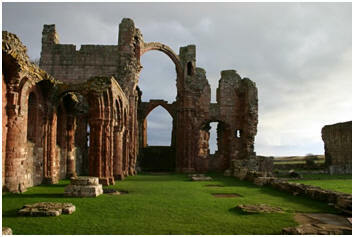 The Lindisfarne Gospels (about 698-721) are illuminated books produced by monks in Northumberland, England. This page shows the decorated initial to the Gospel According to Saint Matthew. At the time the Book was produced, Irish monks were renowned throughout the rest of Europe for their work as scribes and illustrators. Their designs were often worked out on thin pieces of bone or stone, which are more commonly found in Ireland than in Britain. 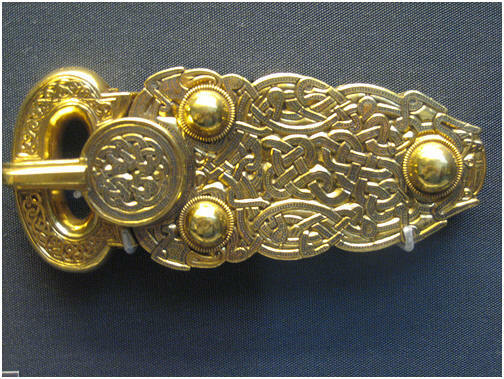 These designs were a true indication of how the missionaries incorporated the art of the pagan Celtic, Pict and Viking world into the teachings of the Christian Church by adopting many Celtic, Pict and Viking symbols and patterns and making them an important part of the Christian ceremonies and manuscripts. and the slowly fading pagan world. 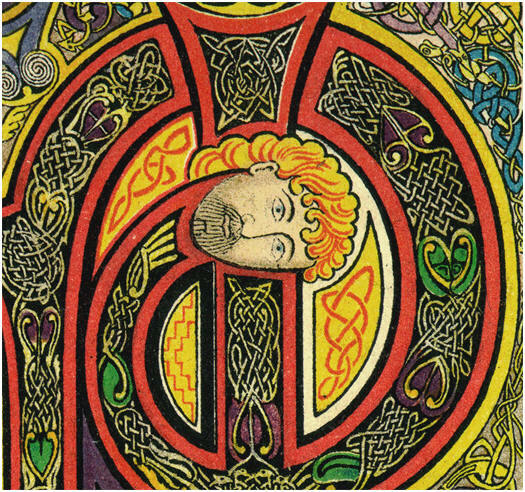 The Book of Kells is the most recognized and most remarkable artifact of medieval Celtic art. It features page after page of lavish, colorful lettering, knotwork, illumination, decoration and illustration. 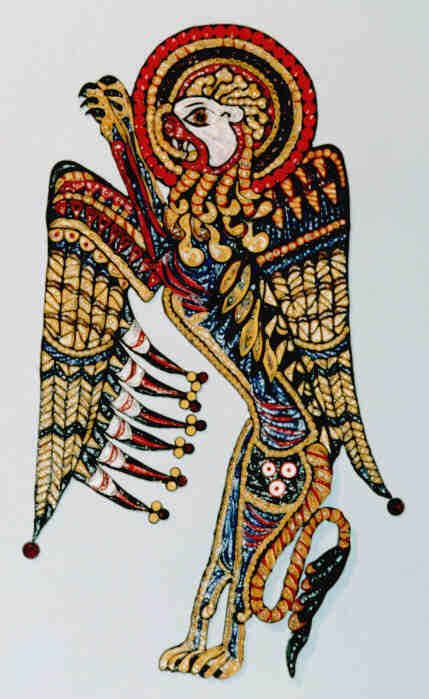 To a large extent, the great reputation which Celtic art and Celtic Tattoo design have today is based on the exceptional quality of the images found in the Book of Kells. The Book of Kells is one of the finest examples of illuminated manuscripts from the era of great manuscripts, 650-800 A.D. As to be expected, the story of the Kells manuscript is shrouded in the mist of history. Students in the field speculate that the Kells book was probably started in the monastery on the island of Iona in the late 8th century and moved to the monastery at Kells in County Meath in the 11th century. The move was provoked, we are told, by a desire to protect the manuscript from the invading Vikings. One story has it that the Vikings had the book in their possession, tore off the jewel-encrusted cover, and threw away the text of what became one of the most famous illustrated Gospels in the world. Since the 17th century, the Book of Kells has been in Trinity College, Dublin. The visitor to Dublin can see the original manuscript under conditions which are designed to protect the book rather than to display it to its best advantage. The Book of Kells is shown under bullet-proof glass closely guarded by a security person. On a crowded day, the line of visitors is expected to keep a steady pace past the display so as not to deny the queue its few moments to view one of the great treasures of Irish culture. Perhaps a book lover irritated by a rushed view of Kells broached the idea of using modern technology to make Kells more readily available for study throughout the world. Written on calf vellum, the Book of Kells is a Latin copy of the four Gospels. The text is interspersed with large illuminated pages, animated initials, beasts, grotesque figures, and brilliantly colored ornaments. The text is written between two ruled lines, which accounts in part for the remarkable steadiness of line in this hand-written manuscript. The monks who worked on Kells did not use gold leaf, commonly used in manuscripts of this kind, but they did use ultramarine, a color which, because of its scarcity, was as costly as gold in the 8-9th centuries. 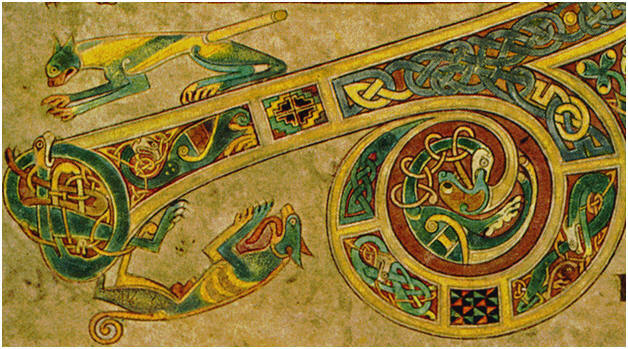 Perhaps the most compelling feature of the Book of Kells is the illustrations. There are decorations at the start of each paragraph and within some sentences. There are agile little animals here and there indicating a "turn-in-the-path," a correction or an addition to the text. So many of the open letters (B,O,P,R) are filled with color that a viewer of Kells can imagine the monk being like so many of us, fillers of open letters. A fortunate visitor to Trinity College on a day when a viewer can study Th Book of Kells will have a feast of illustration. The book contains portraits of the four Evangelists, the Virgin Mary, Jesus Christ, and scenes from the New Testament, such as the Arrest and Temptation. The illustrations are lavishly ornamented with animal and bird figures, snakes, human bodies in contorted shapes, animals eating their tails, eyes and beaks of birds, busy, intricate scrolls. The illustrators seemed to want to fill every open space on the page and the result is a book of great beauty, mystery, and intricacy. The desire to fill open spaces with art is akin to the modern applications of tattoo art covering as much open skin on the human body as possible with the same intricate designs. The illustrations in the Book of Kells are of such intrigue, they have found new life in jewelry, Tattoos and other decorative pieces. The Book of Kells was written on vellum (calfskin), which was time-consuming to prepare properly but made for an excellent, smooth writing surface. 680 individual pages (340 folios) have survived, and of them only two lack any form of artistic ornamentation. In addition to incidental character illuminations, there are entire pages that are primarily decoration, including portrait pages, "carpet" pages and partially decorated pages with only a line or so of text. As many as ten different colors were used in the illuminations, some of them rare and expensive dyes that had to be imported from the continent. The workmanship is so fine that some of the details can only be clearly seen with a magnifying glass. The Book of Kells was probably produced in a monastery on the Isle of Iona, Scotland, to honor Saint Columba in the early 8th century. 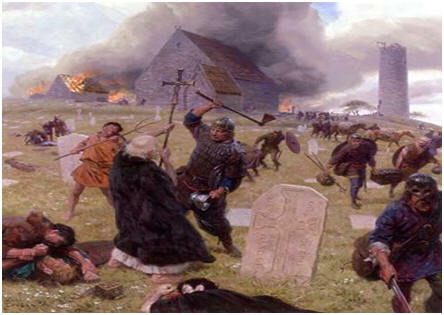 After a Viking raid the book was moved to Kells, Ireland. It is the most lavishly decorated of a series of gospel manuscripts produced between the seventh and ninth centuries, when Irish art and culture flourished at home and in centers of Irish missionary activity overseas. The Book of Kells is not only the most famous manuscript in the Library of Trinity College Dublin, but one of the most famous books in the history of the world, and the most sumptuously illustrated manuscript to have survived from the early Middle Ages in Europe. An extraordinary early manuscript, the Book of Kells has been called "the most beautiful book in the world." Dating to the eighth or ninth century, the manuscript remains a marvel of intricacy and creativity. Created in the scriptorium of the monastery of the Collum Cillae order, the book was named for its home, Kells in County Meath near Dublin. Christianity, as a religion of the book, required that Bibles be broadly available, and the large land revenues of the monastic orders maintained large scriptoria. Few Bibles survived the period; and large illuminated Bibles such as the Book of Kells are exceptional. Work in the Irish monastery's scriptorium was an arduous, but meditative and highly esteemed labor of faith and devotion. The scribes worked through the daylight hours in the scriptorium in absolute silence, communicating their material needs in signs to an officer armarius. Each scribe worked with quill or reed pens and iron-gall ink on a folded section of vellum. 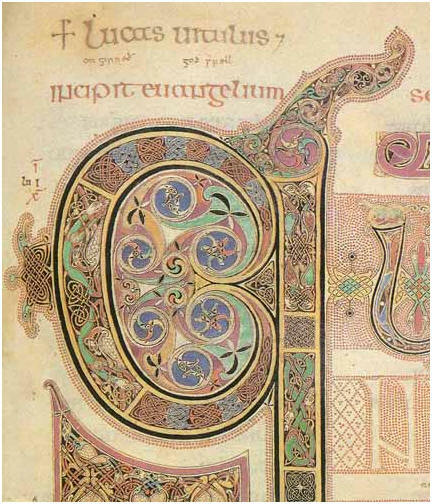 Their Irish majuscule script demonstrates a sense of sublime balance and beauty; the finished capital initials are works of elaborate abstractions. When a quaternion was finished, it was sent to be illuminated. The Kells illuminations are distinctive, intricate, and mathematically precise. Eighth-century illumination usually depicts scenes from the life of Christ, however the Kells illuminators were exuberantly creative, drawing from the rich context of Irish religious imagery and Celtic artistic tradition. The mystical abstraction and high level of detail offered absorbing meditation for the artists and scribes. The craftsmanship shown in the Book of Kells is a distinctive treatment of sacred text, and the tandem work of scribes and artists in the scriptoria established a permanent place in the iconography of the Bible. The book remained at Kells throughout the Middle Ages; venerated as a relic it survived Viking plunderings, arsons, and regicides, although it was lost and recovered, and stripped of its ornamented treasure binding by thieves in 1007. Today the Book of Kells resides at the Library of the Trinity College of Dublin. (possibly from Latin picti, “painted”), one of an ancient people who lived in what is now eastern and northeastern Scotland, from Caithness to Fife. 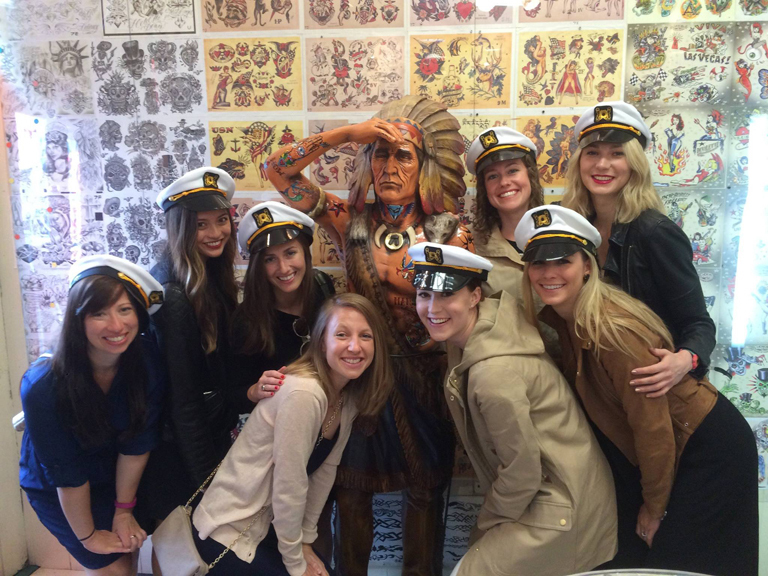 Their name may refer to their custom of Tattooing. 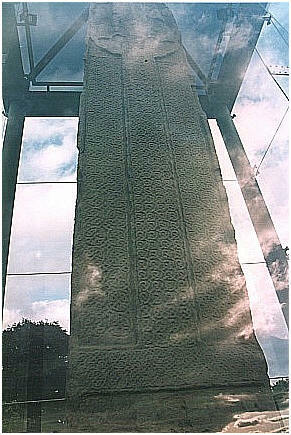 Pictish stones are some of the prime works of Celtic art. even fictitious beasts. The artworks and the carvings are mostly symbolism. area before the Romans arrived in Britain, and were nicknamed Picti (often thought to mean “the painted/Tattooed ones”) by classical authors. 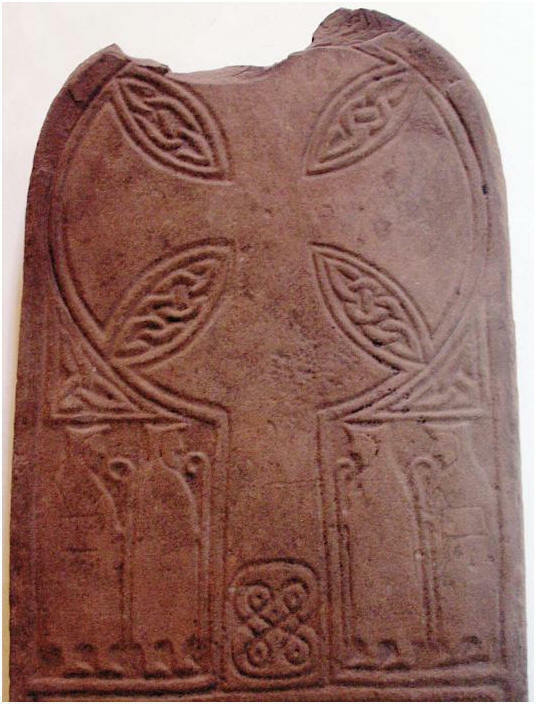 characteristic Pictish symbols, animals and mysterious abstract shapes with Christian designs and symbolism. 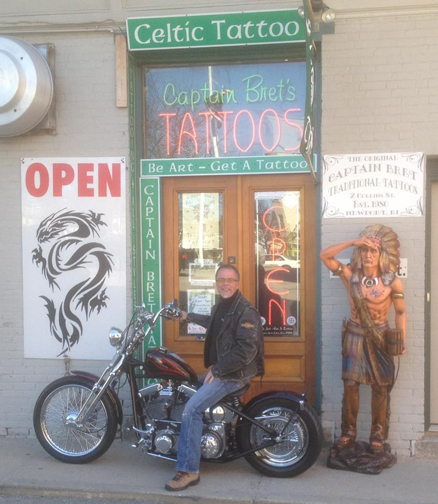 The survival of this art form has made the application of Modern Celtic Tattoos a historically significant piece of Tattoo art for the wearer. The early pictish art which has survived to the present day consists, for the most part, of sculpturally incised symbol stones and a range of beautiful silver and bronze artifacts. Latterly ( 4th & 5th century) the pictish artists, under the influence of the Christian Irish artistic and cultural renaissance turned their efforts towards the creation of devotional sculptures, the cross-slabs sarcophagi and ultimately the intricate illuminated manuscripts, sadly few of which have survived the various religious reforms of the ensuing centuries. 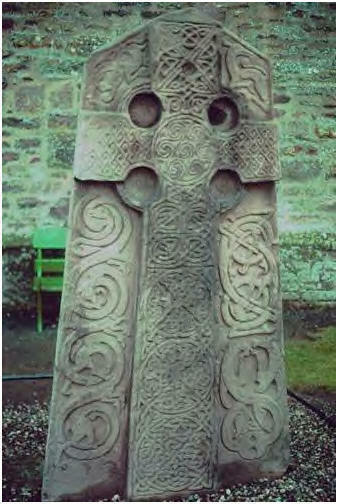 The applications of Pictish design were many and various, spanning centuries chronologically, many miles geographically and both pagan and christian philosophies spiritually. 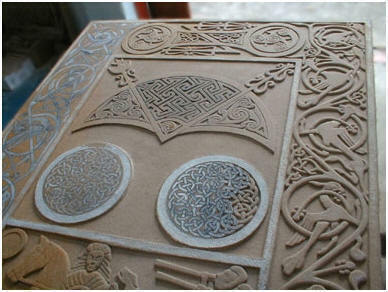 There are designs, however, which appear consistently, which are unique to Pictish art and which developed into an extraordinary apogee, the evidence for which can be seen in the books of Kells and Lindisfarne. This kind of art is popular in Ireland, Wales and Scotland. 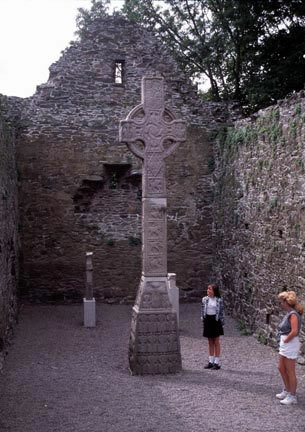 These high crosses are also popularly known as the Celtic cross. 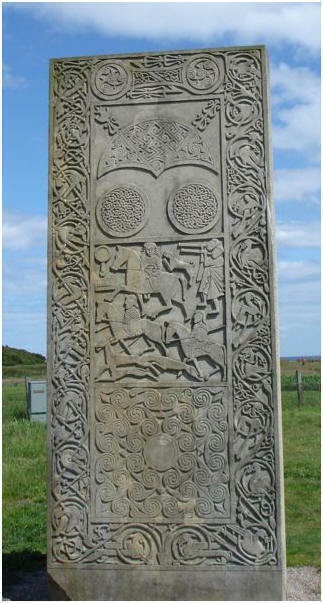 Pictish Art appears on stones, metalwork and small objects of stone and bone. It has similarities to both Saxon and Irish art. Primarily Pictish art is found on the many Pictish stones that are located all over Pictland, from Inverness to Lanarkshire. The stones influenced the monks working on the book of Kells, they copied the style of knotwork and preserved the history of these images, almost all Celtic tattooing done today can be traced to these early examples of art. The purpose and meaning of the stones are only slightly understood. The stones may have served as personal memorials, with symbols for clans, lineages or kindreds. Some depict ancient ceremonies and rituals. A small number of pictish stones have been found in association with burials, but these were not likely their original locations. The stones may also have marked tribal or lineage territories. The largest surviving Pict stone, it is 20 feet (6 meters) tall and encased in glass structure to protect it from the elements. 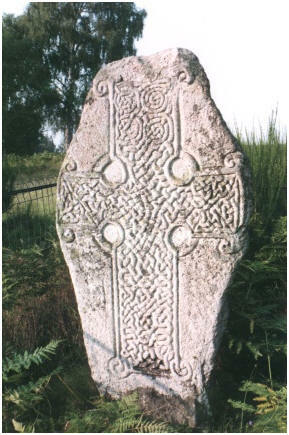 A large Celtic cross carved on one side and over 100 figures on the other side depicting a battle. There are scenes of fighting, decapitation and piles of dead. The dead are illustrated in two groups of seven said to symbolize the Pict nobles of the north and south.